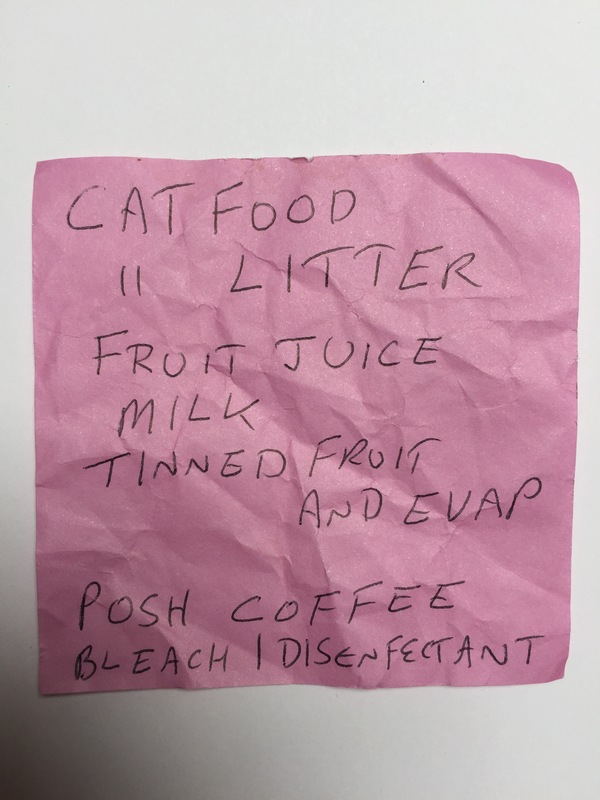 Cat food, cat litter, fruit juice, milk, tinned fruit and evap, posh coffee, bleach, disinfectant. Such a short list but what a pleasure. What is posh coffee, are we talking Nescafé gold blend here? Tinned fruit and evap is a new combination, this is the first time I have seen evaporated milk on a list. we used to have tinned fruit and evaporated milk sometimes when I was a child. Not had it for years since I discovered proper cream! You have your ordinary Nescafe, but posh coffee is for the percolator which gives off a lovely aroma – so someone important is expected (perhaps to buy their house). We always have tinned fruit with evaporated milk – a quick dessert that can be eaten at any time and not make a mess of the kitchen. They are obviously worried about cleaning the smells of the cat away.